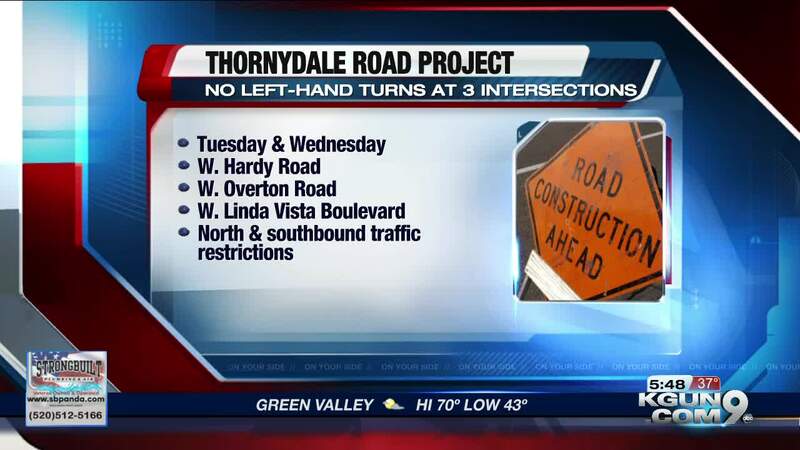 TUCSON, Ariz. - On Tuesday, December 4, and Wednesday, December 5, road work will keep you from making left-hand turns at three intersections on Thornydale Road. The Pima County Department of Transportation says the contractor will be milling and paving on Thornydale Road at the Hardy Road, Overton Road, and Linda Vista Boulevard intersections. That means if you are heading north or south you cannot make left-hand turns for the next two days. Officials want to remind drivers to plan ahead and expect reduced speeds in the area.